It takes a long time to line up those purchases. Art needs appraising, real estate has a whole process, etc. It would legitimately be hard to spend $1B on consumption in a couple of hours, but not because people won't take your money. I don't recall a couple of hours being a condition. Moreover, finding enough things =/= completing the required transactions, most of which can be expedited when one is willing to pay extra. 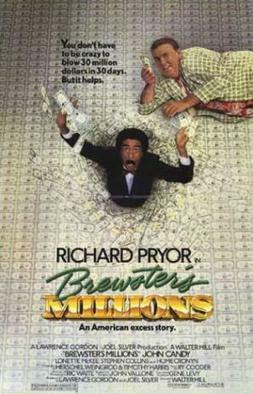 A billion dollars is, after all, only a thousand million dollars. So maybe I don't get the exact Malibu beach house or Manhattan penthouse I would have preferred, maybe the particular art I'd prefer isn't on the market at the moment, etc. But that doesn't mean coming up with the list would be hard. I was talking about liquidity, where speed is an explicit property. Also, it was mentioned in the other examples (emphasis added). I could sell a billion dollars of T-bills in an hour and the price would not move one whit because the daily volume is $490B. OTOH, if I want to sell a billion dollars of real estate in an hour, well it's impossible, and even if it was possible, I'd have to take a big price hit to find a buyer. Well, if you're willing to blow it on "the warm feeling of helping your fellow man," you could be done with it in a few minutes. "Hi food bank, here's a billion dollars, it's now your problem." Yeah, but that was about selling, not buying. Assets don't get more liquid than cash and my response was aimed at your contention you'd have a hard time figuring out what to buy with a billion dollars. I wouldn't. I will buy your billion dollars worth of real estate for $1. That was my whole point. The only limit to spending cash is identifying what you are spending it on and getting it out the door. Perhaps. Perhaps you were obliquely saying how easy it is to spend cash fast. But the variously worded claim that one wouldn't know how to spend some large sum of money, never mind how quickly, has always struck me as facially absurd or else the confession of a pitiful imagination. Whether that was your intended claim or not, that's what I was responding to. This. Much of my exasperation with the public discourse regarding economic matters is the ubiquitous assertion that someone can have "enough money". That there is a figure with which you could purchase everything you could ever want and beyond which doesn't benefit you other than as bragging rights. It's seriously a retarded imagination that can't grasp the concept of 'more'. 'More' is always better. If you have more, you can do more and there's never "enough" such that having more wouldn't be better. It's especially galling to hear people who drive SUV's sit around in their $150 shoes whinging about how "no one needs that much money". I'm sympathetic to OWS's complaints about the 1% gaming they system. But that's not the motivating force. What they're really bitching about is somebody else having more than them. Wealth is almost certainly subject to declining utility. You probably won’t easily get to zero value of a new dollar, but I suspect you’d get close for most people in the billions. My critique is more like the alternative uses for those funds are not obvious given the shoddy mechanisms of political allocation. Another sell off. Seems to be fueled by a Chinese, and to a lesser extent S Korea, crackdown. Or maybe just a cyclical Jan dip. Who knows? If any of you were looking to get into crypto, now might not be the worst time. If you can't get an account on a fiat exchange, you can PM me. Four units in a Northwest D.C. condominium building have hit the market — and in an unusual move, the seller will accept payment in Bitcoin. The team behind the St. James Place Condos, a four-unit residential development at 1471 Girard Street NW, announced Thursday it would accept the cryptocurrency as well as conventional dollars, in what appears to be a first for this market, said Alex Venditti of the Alex Venditti Group of Coldwell Banker Residential Brokerage, the listing brokerage for the property. Some principals in the project’s owner, Coloma River Capital, are investors in Bitcoin, and the move has “opened up a new window of potential purchasers,” Venditti said. “This is a new world, and so we’re trying to speak to the new world, as well,” Venditti said, adding that those types of buyers could include millennials or others who are in-tune with how markets are changing. “Maybe they’re in the beginning of the game, and they don’t have the type of money that it would take to buy something like this, but they do have Bitcoin,” he said. Why would I pay in BTC when it could be worth more if I sit on it for a month? Welcome to the DRC. Get your wheelbarrows ready. I understand what fungible means*. In the past, I have been highly critical of arguments say about funding health care or education, that fail to grasp that concept. Yet it's true that I will part with BTC's far quicker than I will dollars. I would never suggest putting the bulk of your savings into BTC. Yet my trivial investment has grown to several times my prior savings, and while I sold tens of thousands of dollars of my BTC holdings just a couple of weeks ago, I'm still holding hundreds of thousands of dollars in BTC in the hope it will one day be worth millions. Because even if it goes to zero tomorrow I will still have done very well by BTC and any pangs of loss will be mollified. I'll have no regrets. I'm certainly better off than all those smug people that keep on insisting it'll never fly. You know who you are. *Wait, let me check *googles*. Yes that's what I thought it meant. But if one day your BTC is worth millions, why spend it then, when you could wait and it could be worth billions? Oh I won't. I'll only take several hundred thousand off the table. That's what's got me this far. I might have cashed out when I doubled my money, or when I increased it by an order of magnitude or two. But I'm so glad I didn't. It's definitely closer to commodity than currency. But I think we need to start thinking of digital assets as their own asset class. If you had money in the bank, you wouldn't spend BTC on expenses. That's my point. How is the asset disposed of besides liquification into fiat? Assets have a use value as well as a monetary price, right? BTC will be without intrinsic value if you can't cash it (as in S. Korea), but why would you cash in if the value spikes so dramatically that you could lose money by spending your BTC? It's a closed loop. CryptoBux won't work unless it's truly distributed, and none of them are. Except most commodities have a use. If bitcoin isn't a currency it's just a digital distributed ledger, which has no value. Warren wrote: Whatever lets you sleep at night. That's going in the act.